Guru Purnima is a sacred day in Hindu culture, observed on the full moon day of the Hindu month Ashad which coincides with the months of July to August of the Gregorian calendar. It is believed that ‘Guru’ (the teacher) is the second most important influence in the life of a child, after his/her mother. Guru organizes the thinking or learning pattern of a growing child predominantly. Guru Purnima is celebrated to commemorate the teachings of the divine sage Guru Veda Vyasa who is the creator of the four Vedas. Guru Veda Vyasa is believed to be the ultimate Guru as he is said to mentor Dattatreya, the Universal Guru, the reincarnation of the divine trinity- Brahma, Vishnu, and Mahesha. This auspicious day holds a lot of importance in the life of farmers too. They pray for abundant rain and perform poojas and wish for peace and prosperity to prevail in their fields as well as their homes. Guru Purnima also signifies the day when Adiyogi introduced his disciples Saptarishis to Yoga and taught them their first lesson. It is, therefore, believed to be the auspicious day for starting the practice of Yoga and meditation. It is also believed that this day marks an ideal start for learning new things as receptive powers of a learner are prominently high because of the makeup of cosmic energies. This day marks the end of the summer solstice, and up to the start of the winter solstice, a person is believed to be in their best state of mind, energy, and receptiveness towards knowledge. Those who practice spirituality wake up at Brahma Muhurta- which occurs at 4 am. They bathe, don their sacred clothes, and start meditating keeping the image of their teacher, specifically their feet, in their mind. This is believed to be the ideal way of thanking their teacher for being a guiding light. All those people, who belong to certain schools of thought, organize satsangs and discourses to precipitate the teachings and principles of their propagator among wider audiences. There are certain symbolic practices also which are prevalent among followers. They may feed some sannyasis at their homes, or organize common meals at places of worship, as a symbol of offering to their teacher. 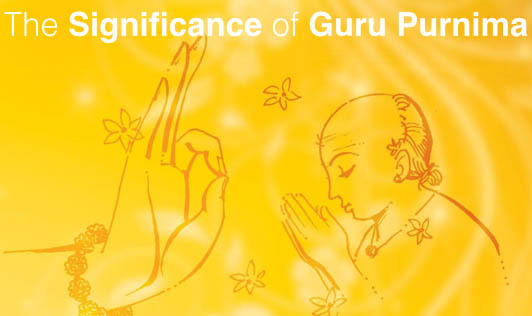 Guru Purnima is believed to be the day for reflecting on the teachings of a Guru. Some followers fast the whole day, while others observe silence throughout the day. This captures the real essence of celebrating Guru Purnima. So, celebrate the spirit of teacher-student relationship and reflect on the principles and teachings which you have acquired from your teacher by observing the auspicious day called ‘Guru Purnima’.